Set in the small rural town of Granby Texas, White Trash follows multiple characters whose lives are all somehow connected. The story begins when Thia Franks returns to Granby after having sworn to never return to the small southern town. After finishing her undergrad at Duke, Thia follows in the footsteps of many Granby young women and gets knocked up. Not knowing what else to do, Thia brings her daughter Ella back to her hometown to live with her mother. As Granby's top newspaper reporter, Thia hears about everything that goes on in her town including racism, ignorance, abuse, and affairs. Alexandra Allred elaborately describes the inhabitants of Granby including characters like Chester Kennedy, whose fainting goats constantly wreak havoc on the small town. Things spin out of control even more when James Otis, a young black man, is brutally murdered. The town cops have few leads and racial tensions continue to rise. I throughly enjoyed this novel. Having grown up in a small southern town myself, I could relate to many of the happenings within the book. Allred paints an accurate picture of life in small southern towns and is able to exemplify the complexities within. While many of the character's actions are looked down upon, Allred also presents characters who are hard working, caring, and honest. I at times had trouble keeping up with all of the characters, but found myself wanting to know more about each of them. I especially liked how Allred created a mystery that tied so many of the characters together in the end. 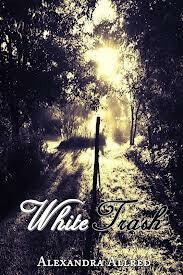 White Trash does an excellent job of reaching into the heart of a small southern town. I really enjoyed the descriptions of all the characters and found myself wrapped up in the mystery of James Otis' murder. I'm usually pretty good at figuring out "whodunnit," but I could not guess this one! There were so many crazy characters that I could imagine any of them being capable of anything, even murder. The book was very funny in parts and serious in others. Alexandra Allred spins a good tale while exposing prejudices, and showing the underside of life in a small town.